Find out who calls you and protect yourself from unwanted calls! With the tellows app it is now possible to assess incoming call at first glance! For free! Rated over 4.500 times and with 275.000 downloads! This app will give you the knowledge of all of tellows‘ Community right on your phone! 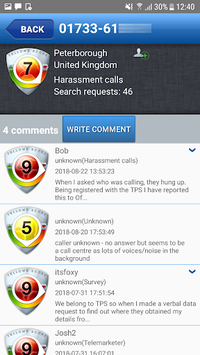 Thanks to the tellows score the app displays the nature of the incoming call via a live sync to the tellows servers and you can decide whether to answer the phone or ignore the call. If the calling phone number has an official entry on tellows additional information like name and address will be shown. You may add these details to your contacts with one click. Furthermore, you can rate numbers, comment on them and, therewith, warn your fellow tellows users against potential dangers. The service is free. Unwanted commercial callers, subscription scams or annoying market research calls can be detected right as they ring with the tellows app. Thanks to the huge tellows community and its many ratings, every telephone number is assigned a tellows Score that indicates whether it is a trustworthy or an untrustworthy number. If the number is registered in a public phone book you will also get the caller’s name and address displayed on your call screen. Further you are able to rate numbers and leave comments on them yourself and receive additional information on all incoming calls. With one step you can also comfortably add this information to your contacts. This service is completely cost free for you. You can also connect to your tellows account and leave comments that are assigned to you across all your devices. 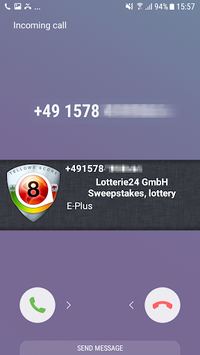 In the Premium Version you will also be able to block calls as well as identify them. 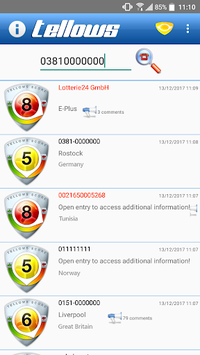 All currently rated dangerous numbers are saved on your phone and can be blocked even if the phone is offline thanks to locally stored and updated blacklists. You can also use a personal blacklist that contains all numbers you rated negatively. The Premium Version does not contain any advertisements.